We are one of the renowned organization, which is engaged in manufacturing, trading and exporting a wide array of Packaging Machines. The offered range of machines is fabricated by our experts in compliance with the industry laid standards & norms. Under this range, we offer Distribution System, Multihead Weigher, Rotary Table and Take Away Conveyor to name a few. These machines are widely known for their sturdy construction and longer functional life. DXDT8 packaging machine for tea bags has the function of auto filling,bag sealing, thread affixing,labelling,external bag heat sealing,auto counting.etc. lt conforms to food hygiene standard , and is a low-cost high-efficiency ideal equipment for tea and foodstuff industrial sector. lt is mainly used for packaging of medicine tea,beauty- slimming tea,health-strengthening tea or other similar fine- particle products. This machine a new type of constant filling machine for powdery and flaky material developed based on foreign advanced technology. This machine features unique construction, accurate, stable and reliable metering and convenient operation. Bucket weighing with accurate weighing. The portion of the system in contact with the material is made of stainless steel, so there isn't rusting. Provided with dust removal system to Suitable products for packaging such as flour, corn flour,bran forage, chemical fertilizer etc. The unit includes DT series vacuum elevator ,DT series horizontal type auger conveyor, second material storage hopper CJS2000 series auger filling machine,VFS5000F vertical packaging ZB1000 vacuum machine, dust collecting system and product conveyor. According to different material (granule, powder )the bag can be designed to different size and shape(rectangle/cube) The product seals well, so the product have a long sealing time and good looking. The unit re-automatic material conveying, filling, packaging reshaping sealing cutting finished product conveying, dust collecting PLC and touch screen The unit is widely used in tea medicine and chemical industries. 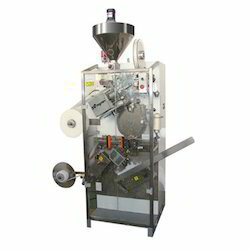 Model VFS5000D auto-filling packaging machine is a new generation packaging machine developed by our company for packaging small- particle material in such sector as agro chemistry, foodstuff, etc. This packaging machine integrates many functions as of bag making, filling (decelerated packaging or aerated packaging), sealing, slitting, printing and counting, its packaging rate can reach 70 bags/min and the width of packaging film is 100~420mm, it can make pillow type bags, handbags, standing bags, etc., printing and counting, its packaging rate can reach 70 bags/min and the width of packaging film is 100~420mm, it can make pillow type bags, handbags, standing bags, etc. 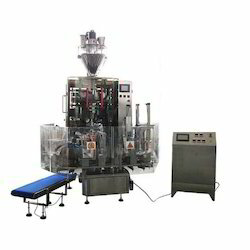 Compared with previous products, this machine adopts a kind of unique film feed system with very stable film feed without meander; and adopts servomotor drive for film pulling; touch type operation very intuitive man-machine dialogue; compact and durable ensures continuous trouble-free operation of this machine. The design of this machine has absorbed tens of years of Zen gran Company in manufacturing of packaging machine, performance, technical indexes and cost performance of this all lead the counterparts of foreign countries. GFCF/25 automatic powder bag Feeding unit thereafter referred to as packaging unit is a new type of packaging unit developed by our company for packaging of powdery matetial in such sectors as of agricultural chemicals, food. etc. 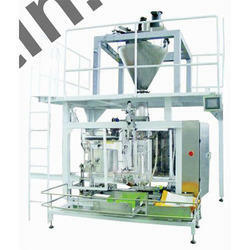 This packaging unit has the functions of automatic bag feeding, bagging, filling, pack delivery, sealing etc. its kernel control section adopts Siemens S7-200 226 controller and MT506M toch screen making the degree of automation of this system and operation reliability reach advanced level. 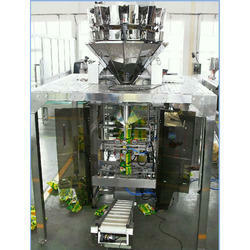 This packaging unit is convenient maintenance, stability and reliability wide range of application etc. 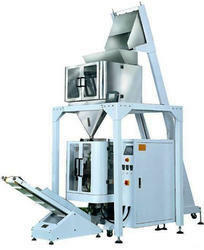 Description: the small bags of granular or liquid product packaged by small packaging machine pass through conveyor line, elevator and shaping equipment and then fall into the large packaging machine orderly or unordered, and are packaged into bag-in-bag product after being shaped or evacuated by the large packaging machine. 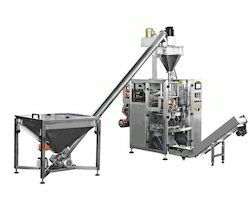 Process flow: automatic small packaging machine —> counting and shaping line --> elevation and conveying line --> counting and buffer bin--> large packaging machine or evacuation-->finished product conveying line. This machine consists of one VFS7300 vertical packaging machine one CJF2000-F auto weighing machine and DT2 cups of vertical elevator It is suitable for packaging of loose and non-sticky granular powder products. All the works of bag-maki measuring, folding, filling, sealing, cutting, heat-printing be done automatically. Food Products : Snacks, Seeds, Nuts, Tea, Frozen Food, hot pot seasonings, flour, sprout bean, coffee, rice, grains. Chemicals: pesticides, additive painting, chemicals etc. 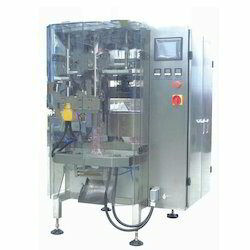 Various automatic packaging solution available. From Low price to high end. Mechanical, pneumatic, servo motor based solution available. Complete stainless steel construction is also available as an option. Solutions for various bag type such as pillow, folded and self standing. Bottles & jar filling complete solution. To meet the client’s requirements as per the requirements of the customers, we are involved in providing a huge range of Linear System for Packaging. This Linear System for Packaging is available in the market in bulk at most reasonable rates. The Linear System for Packaging is extensively used across a broad variety of different industries – among them the food and packaging sectors.